A tiny Vanderbilt University Medical Center volunteer has received a giant award from a national organization. Swoosh, a 7-year-old toy Pomeranian, and his owner Michelle Thompson of Franklin, Tennessee, received the Animal Medical Center’s Top Dog award in New York City on Tuesday. The Animal Medical Center is a not-for-profit hospital for companion animals and an institute for veterinary education and research. Active volunteers at Vanderbilt University Medical Center since 2012, Thompson and Swoosh visit most often with pediatric cancer patients at Monroe Carell Jr. Children’s Hospital at Vanderbilt. They are both part of a national clinical trial of therapy dogs in pediatric oncology called the Canines and Childhood Cancer Study. The Vanderbilt portion of the study is being led by Mary Jo Gilmer, Ph.D., MBA, RN-BC, of the Vanderbilt University School of Nursing. Thompson and Swoosh have been a certified animal therapy team for more than three years. Animal-assisted therapy dates back to the 1700s, but has been widely recognized in the United States since 1969. 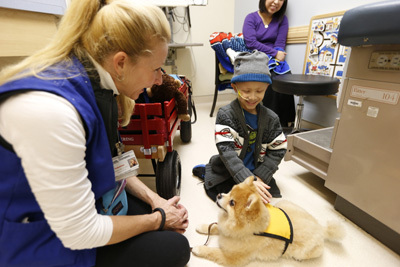 “Before others recognized Michelle and Swoosh as ‘Top Dog’ award winners, they were always our top dog team,” said Stephanie Van Dyke, director of Child Life and Volunteer Services for Children’s Hospital. “She and Swoosh are integral team members. Not only do they exhibit the heart of a servant through volunteer service, with every visit they help reduce stress and anxiety and normalize the health care experience for children and their families. They motivate and inspire. “They personalize health care experiences. They complement the medical treatment so that the whole child is being cared for — physically, emotionally and developmentally. When we speak of a healing environment, we speak of Michelle and Swoosh. We could not be more proud of this accomplishment and this special recognition,” Van Dyke said. Thompson said that patients at Children’s Hospital love Swoosh. “He sits in their laps; they pet him, talk to him and give him treats. Mostly, he’s just a warm little fluffy thing who brings some comfort to those around him,” she said. Swoosh and Thompson are certified by Therapy ARC (Animals Reaching Clients), which trains volunteers and evaluates them with their pets so they can visit patients/clients in hospitals, nursing homes, hospice and physical therapy centers, schools, libraries and many other facilities. Therapy ARC ©2017. All Rights Reserved. Therapy ARC is a 501(c)(3) nonprofit corporation.